Create a tissue flower garden! Decorate in colorful style! 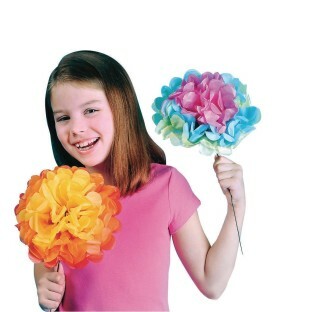 Make your own giant flowers from colorful tissue paper. A great way to celebrate spring or summer. Includes assorted colors of precut tissue paper, stem wire and instructions. 10" diameter. Pack of 84. Great Product! We are using for our father daughter dance as centerpieces. Girls feel a part of the planning and can be proud of their work. They are delicate so a heavy hand won't work. used this as an activity for a mother's day event. the paper is delicate so when separating sheets they may tear if you go too fast. instructions say use 6 sheets but looked better with double that amount. may be a project for slightly older children as the metal stem may be hard to bend or have adults on hand to help. The results are always pleasing! I am a Life Enrichment Director. My residents love using this product to decorate for our parties. This is also a great product to have on hand for emergency projects! Easy to make kids love it! This was a craft for a rain forest themed Girl Scout Camp. The girls that got the bright colors loved them. The girls that got the colors after the bright pinks purples blues yellows and oranges loved them. Then we ran out of those colors and ended up with just the greens and brown. There should not be brown tissue paper in this kit.